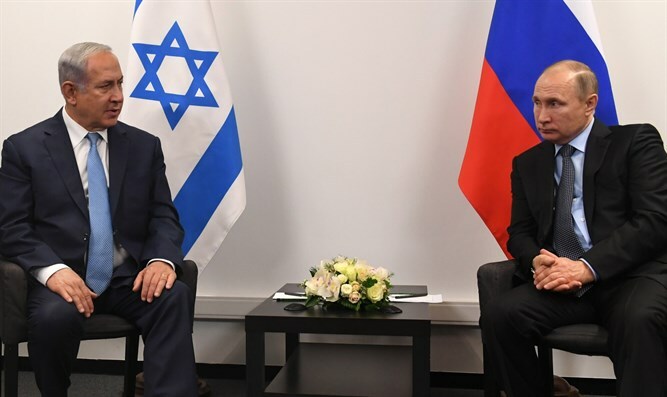 ‘I made clear to Putin that Israel won’t tolerate Iran in Syria’PM opens cabinet meeting by addressing talk with Russian leader, saying the two agreed to work for withdrawal of foreign forces from Syria. Prime Minister Benjamin Netanyahu delivered remarks at the start of the weekly Cabinet meeting on Sunday. “On behalf of myself and all government ministers, we would like to express our condolences to our friend Yisrael Katz on the passing of his mother, the late Malka Katz. I knew her; she was a very impressive woman. Malka Katz experienced the hardships of the Holocaust, passed through seven extermination camps, immigrated to Israel and established a splendid family imbued with love of the land and love of the people, which was well-rooted in our heritage. She was a very special woman. We all share in the grief of the Katz family. Last week I met with Russian President Vladimir Putin in Moscow. As I promised, the focus of our discussions was the Iranian issue. I made it unequivocally clear that Israel will not allow the military entrenchment of Iran in Syria, and I also made it unequivocally clear that we would continue to take military action against it. We agreed on the continuation of the security coordination mechanism between the Russian military and the IDF. President Putin and I also agreed on a common goal – the withdrawal of foreign forces that arrived in Syria after the outbreak of the civil war. We agreed to establish a joint team to advance this goal, together with other elements. I invited President Putin to be the guest of honor at the dedication of the memorial to those who fell in the siege of Leningrad and he accepted my invitation. It is no small thing that we have such strong, good and close links with leaders of the major powers in the world. These links serve the security of Israel. Last week, another very important thing occurred diplomatically and concerning security. This was Britain’s decision to outlaw Hezbollah and to define all of Hezbollah’s parts as a terrorist organization. This is an important decision because Hezbollah is a terrorist organization in its own right, and it is also the main terrorist arm of Iran. I call on other countries, first of all in Europe but also around the world, to join this important move by Britain. In recent days there has been another shocking ant-Semitic incident, again in Strasbourg – a monument to a synagogue that was burned by the Nazis was vandalized. I strongly condemn all manifestations of anti-Semitism, and I call upon all leaders of enlightened countries to join in the systematic and continuous denunciation of antisemitism. The first way to fight antisemitism is to denounce and condemn it. New GOP legislation: Recognize Jerusalem as Israel's capital Senators Cruz, Heller and Rubio unveil legislation recognizing Jerusalem as Israel's official capital and moving the American Embassy there. Lebanon decided on Monday to put the northern city of Tripoli under the command of the military for a period of six months, reports The Daily Star.